To celebrate the 4th anniversary of Pigeon Breeders’ debut release, Squab, here is a batch of recordings from June they did at CJSR. Includes an interview! Recently, we’ve had a bunch of our releases reviewed on various sites. It’s about time to throw them up on here. Lots of digs. Nearly a year between appearances, Edmonton’s Michael Toepfer returns with another Potier. tape. Titled ‘Ductile’, this relatively-brief cassette demonstrates well the live performance of Noise, not only through the intense energy peaks of Toepfer’s last endeavor, but with the additional dynamics of practice – the setup, the fondling, the ambiguity; here complimented by additional materials like wood and metals sniffed-out by contact mics. The punchy angles are still there, repeating the arrhythmic outburst of frustration which is the driving force of Harsh Noise, but the finer-tunings around the edges have allowed in a more qualified contrast across each side (the “duct” of the title: pores, vents and gills), no matter the levels, indicating a more meditative and efficient performance overall. Pigeon Breeders say they ‘specialise in improvised music’, but they don’t say what the parameters of their improvisations are, whether they agree on anything in advance, or whether they simply find their way interactively each time they start playing. Frankly, I like not knowing, and I would tend to argue that, when the result of the improvisation is this sort of music, the degree of agency, preparation or intentionality is largely irrelevant, although clearly the creative fluidity of improvisation is important. So what is ‘this sort of music’? Well, I try to avoid reducing peoples’ specific, lovingly crafted artistic utterances to a generic typology, but what I meant there was music that doesn’t appeal to the conventional ideology of art and craft to fix and locate its meanings. The music on Nocturnal Reveries is essentially ambient, in that its pulse is indeterminate, and that it evokes an atmosphere or implies a space, rather than articulating a (melodic, lyrical or any other kind of) narrative arc. The sounds in which it trades are recognisably the product of musical instruments, but Pigeon Breeders largely eschew the traditional signifiers of musicality, preferring instead to explore the sonic landscape of mechanical repetition, material stresses, and other processes in which sound creation is an incidental by-product. Only in ‘Melatonin’ and ‘Cold Sweat’, the final two tracks, do they allow overtly melodic materials to creep in, and then only as grist to the same repetitious mill that has ground out the rest of the album. These improvisations, while demonstrating an impressive degree of instrumental control, more importantly (and interestingly) proceed from a creative discipline and focus that is as unusual as it is single-minded. To resist the urge to vent your inner state runs counter to many people’s conception of improvisation, but Pigeon Breeders keep their collective eye on the ball, and Nocturnal Reverie successfully navigates the gap between impersonal automatism and subjective expression. Nocturnal Reveries is a 7 track album by experimental ambient / noise trio Pigeon Breeders based in Edmonton, AB which was released on the Ramshackle Day Parade label. On Nocturnal Reveries the band focuses on creating lush bodies of noise that see Pigeon Breeders working with a more organized arrangement of songs as oppose to the freeform chaos that has become ubiquitous to this style of music. On Nocturnal Reveries the band exploits and manipulates their instruments into forming layers of texture in order to create an encapsulating amount of depth. What sounds like bottles or pieces of metal clank together in the foreground of ‘Urban Decay’ while orchestral bodies of sound rise and fall in the background. The track does meander for a little bit but further in it becomes more dense and intense as a variety of strange and otherworldly noises are introduced into the mix. Modulated pitches emit swirls and screams and rebounding bleeps and bloops that appear as though they are interacting with each other. As I listen I imagine the sound coming from a large mothership hovering above a city. As I described, there are a ton of sound to hear in the second track alone but throughout the span of the album Pigeon Breeders continually introduces something different, even if you are unsure of what the origin of the sound is. I think what is even more impressive is that Pigeon Breeders doesn’t simply stick to a certain set of sounds, they maintain their own identity through their playing style and consistency alone. One of my favorite things about Pigeon Breeders is each members ability to play like a normal band, to turn these otherwise directionless, formless ambient / noise epics into more structural compositions by introducing instruments not normally prevalent in noise and ambient, specifically the drumming on ‘Garlands’ and ‘Light Clutter’ in which the band implements into their songs surprisingly well. The drums aren’t just thrown in either, Pigeon Breeders instead builds the other components of their music around them adding an additional level of familiarity to an otherwise alien mixture of sounds. Instead of playing like a normal band, with guitars that sound like guitars, synths that sound like synths, bass that sounds like bass, etc. 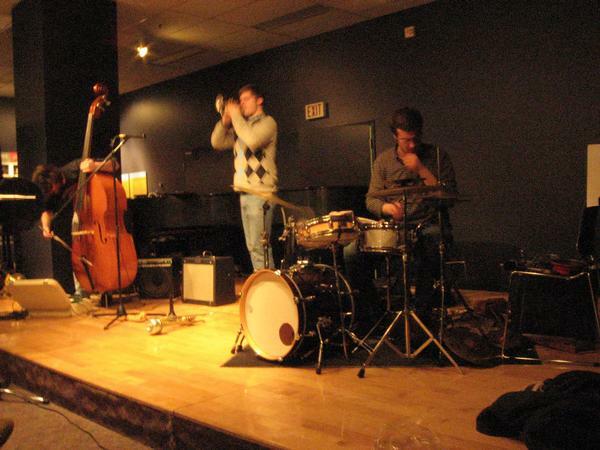 they use their instruments to create sounds that the instrument wasn’t initially designed to create; in a way the band transcends the identity of a band in relation to their instruments and instead, like many ambient / noise musicians they ditch the whole idea of the musician behind the music by introducing familiar sounds that are unfamiliar within a specific genre. There were moments on this album were I was feeling bored. I was impressed and constantly intrigued by the first half of the album, it all felt so dense and at the same time airy and expansive but after ‘Light Clutter’ a lot of what I heard didn’t really do much for me, the rest of the album felt static, it lacked the energy that I craved from earlier in the album which is unfortunate considering how strong the album was up until that point. This is a good release from a young group that simply lacks a little polish. The trio creates organized movements of sound that remain complex and spontaneous in nature, it is as though they are not being composed by a group of musicians but by a body of advanced machinery or a piece of futuristic technology; that of which is the raw collective sounds of metal rubbing against metal, hissing and screeching, and low hums juxtaposed by high orbital sirens that surround the listener making it apparent that this release is just as much a visual experience as it is an audible one. 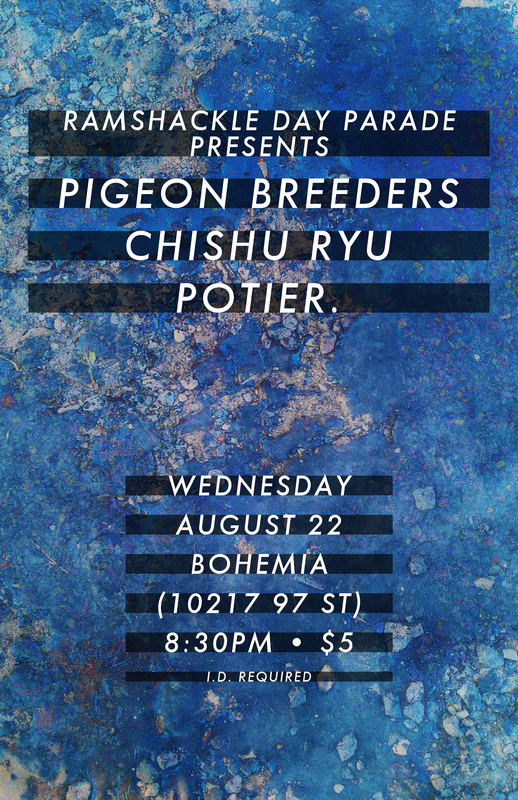 AUG 22: PIGEON BREEDERS / CHISHU RYU / POTIER. Some-kind-of-wonderful care of that rad guy who you know as Jom Comyn. Rad samplertronica. See him before he leaves the city for an indefinite amount of time! Bring I.D. or you will miss this. JUNG PEOPLE Kanata Tour — Update! Info from the Jung People Kanata Tour (Facebook Page). Also, in the TBA dates, we need help, so if your are in a band and need another to fill the bill, or promoter, consider us? Thank you! have a beautiful summer, we can’t wait to meet all the great people across this beautifully large nation. Shot & Edited by Razvan Theodor and Vlad Socaciu in February 2012. 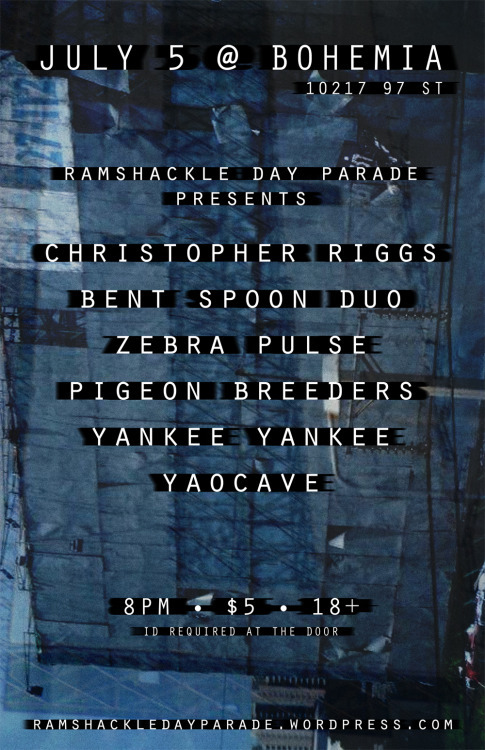 “Veil” appears on the 2012 Ramshackle Day Parade compilation. Ramshackle Day Parade Presents a night of forward-thinking music: brave avant-interlopers, from as far away as Detroit. This show will feature a once-only chance to witness a collaboration between Bent Spoon Duo and Christopher Riggs. Christopher Riggs is from Detroit, and thanks to the Calgary 2012 grant, will be coming to Alberta to play a series of shows and teach a masterclass at Calgary’s Theatre Junction Grand. He plays guitar, focusing on altered preparations, and his own style of notation. He will be playing a set with Bent Spoon Duo. Adding an insane drummer to the already insane lineup has, (in this guys highly biased opinion,) put new wind in the sails of Zebra Pulse. Absolutely face-melting live and a must-see. The Charles Barkley of free-improv, with three Charles Barkleys. This Calgary two-piece is a brain-massaging space ritual of widescreen proportions. First show in Edmonton. Calgary’s Jevon Voon makes twisted songs: crooning over African music, British Folk, Minimalist, Fluxus composers, and whatever else is lying around. Edmonton’s annual art & design festival, The Works, kicked off today. There’s tons of great art and music events going on, and here’s a list of some experimental sound performances that will take place on the Churchill Square stage! *Jung People are an amazing post-rock band from Calgary that are on tour this summer. Catch them in Edmonton in late August with Pigeon Breeders! More info coming soon.